It is stylish and multi-functional. One bag, many uses. The VISIBAG has high visibility panels and wide reflective strips arranged strategically to command maximum awareness of the user in all seasons and weather conditions. 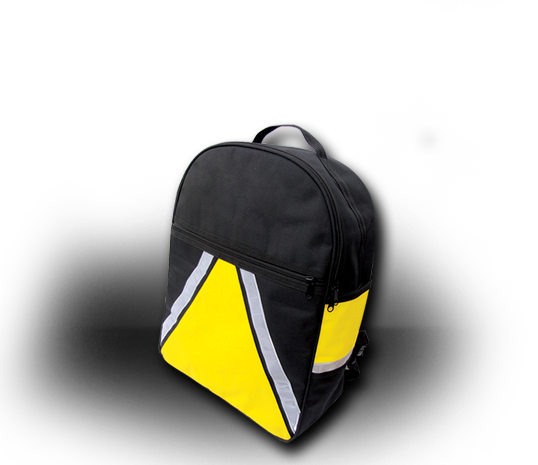 Made from 600x600D heavy duty polyester the VISIBAG is robust and shower proof. It has a large top opening compartment and a front flat document pouch. Each is opened by easily gripped zips. Along each side there are sleeves designed to hold a stick/crutch holder which can be purchased separately. The standard harness fits chairs with or without headrests also wheelchairs and rolling walkers! It has adjustable straps fitted with slide and snap fasteners. The VISIBAG is 46cm or 18in tall - 35cm or 14in wide and 15cm or 6in depth. Superb WHOLESALE PRICE + discounts! Immediate dispatch for SINGLE SALES! Call or Email ... NOW! I'm interested in this accessory for myself. I'm interested in this accessory for my shop.